Party Bus San Antonio is the best way to explore this great city. Nicknamed “Alamo City”, San Antonio is the second most populous city in the state of Texas, and the seventh most populous city in the United States. Travel in style through the heart of Texas. There’s plenty of things to see and do in a Party Bus San Antonio, you’re sure to have a great time. Some popular destinations in San Antonio include The Alamo, Casa Navarro State Park, King William Historic Area, Aztec on the River, River Walk, Six Flags Fiesta Texas, and much more. With so much to see in this city, you’ll never run out of places to visit in your Party Bus. We also offer services in surrounding cities like Kirby, Leon Valley, Converse, Live Oak, Universal City, Schertz, and more. 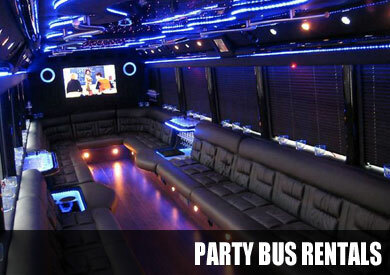 Party Bus Rental offers services in San Antonio, Texas as part of our nationwide Party Bus rentals. We offer the best limo-style Party Bus service in the San Antonio area. You get high quality style for an extremely affordable price. This means you and your friends can experience the finer things about San Antonio without worrying about your wallet. Save money and experience the city without going broke. You haven’t truly experienced San Antonio until you have cruised through its streets inside one of our luxury party buses. Whether it’s a bachelor party, birthday party, sporting event, concert, or something else, we’ve got the right vehicle for you. We have the largest selection of Party Buses and limos available for any occasion. Whatever you need, we’ve got you covered. From Hummers, to Escalades, to stretch Lincoln limos – check out our amazing selection of vehicles. Our talented chauffeur will take care of all your needs, and even help you find the best spots in the city for you and your friends. We offer the highest quality Party Bus rentals at an affordable price. Get an instant quote now. With our fleets available for you all night, you don’t have to worry about leaving anyone behind. Party Bus San Antonio has a team of drivers excited to transport you to any destination and provide a return ride home. From a one way trip, point to point transportation, or round trip, we’ve got everything taken care of. 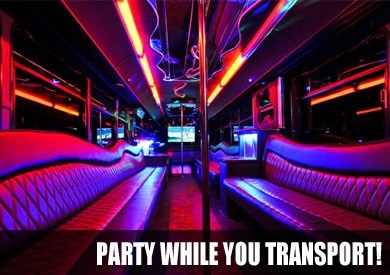 With a Party Bus Rental, it’s like you’re traveling around San Antonio inside your own private club. And there’s no need to worry about a designated driver – our Party Bus service will get you home safely. The traditional limo seats up to 20 at most. Our Party Bus service can seat up to 50 passengers, with plenty of room left to dance in the coach. Our vehicles are equipped with club-quality sound systems – some even include satellite TV and restrooms. The features will vary from coach to coach; from 15-seaters with black leather seats and plush carpet, to 40-seaters shinny hardwood floors and dancer poles. Take a look at our site and see which vehicles will be best for your group.